Ospreys were on the brink of extinction in the 1960s and ’70s but have made a major recovery. Photo by William A. Canosa. 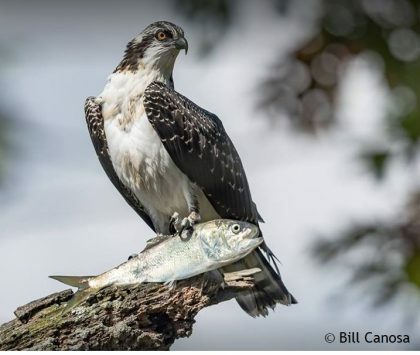 Osprey Nation is Connecticut Audubon Society’s citizen science partnership, launched in the summer of 2014, to monitor the health of our state’s Ospreys. This link will take you to a page with a table that shows the numbers, year by year, and with our interactive Osprey Nation map. Connecticut’s Ospreys need your help and expertise! Our network of Osprey Nation stewards collects and sends us data on the birds’ arrival dates each spring, the location of nests, nesting success and departure dates. We enter the data on a map for everyone to view. Osprey Nation is a partnership with the Connecticut Department of Energy and Environmental Protection and we the data to DEEP biologists. We also ask the stewards to monitor the condition of Osprey nesting sites, especially poles, and to work with Connecticut Audubon and the Connecticut DEEP to make sure they are safe and secure. We are continuing to add nest locations to the Osprey Nation map. We are also looking for trends that would indicate whether the state’s Osprey population is declining or increasing, and what those trends might tell us about water quality and fish populations. It was only several decades ago that the widespread use of DDT brought these great fish-eating raptors to the brink of extinction. But with a ban on this toxic pesticide and the efforts of government biologists, conservation groups and individuals, Ospreys have made a dramatic comeback.